Landowners have been given a very short time frame to comment on a massive crude oil rail loading facility proposed at the hamlet of Rosyth about 10 kilometres southeast of Hardisty, Alberta. Many local residents are concerned about increased rail traffic, noise and toxic odours; longer waits at railway/road crossings; safety issues including potential derailments, spills, leaks and fires; visual impacts; negative impacts on their health; property devaluation, and changes to their overall quality of life. Information sent by USD Terminals Canada (based in the U.S.) and Gibson Energy Partnership to local landowners November 27, 2012 indicates the crude oil rail terminal project will cover over 350 acres, taking up the majority of Section 23 at 23-42-9 W4M. Landowners have essentially been given only 1 month to comment on the proposed development, with Gibson expecting approval by the Energy Resources Conservation Board (ERCB) for its part of the project by the end of December, 2012 and USD expecting approval for its part of the project by January 2013. Unfortunately, even though landowners located several kilometres from the facility will be directly and adversely impacted, personal consultations have taken place with only landowners and residents located within 0.5km of the project and notifications have been issued to only landowners, occupants and urban authorities within 1.5km. The proposed megaproject will load crude oil into rail tank cars in units of up to two 120-car-unit trains per day, increasing rail traffic along the Hardisty/Wetaskiwin CP Rail maintrack by over 33%. The terminal will include a wye track, loop tracks, 30 loading positions under a covered loading rack, a train staging area for up to 6 unit trains (720 rail cars), single rail cars not handled in unit trains, on-site office and an operations facility, four 15,000 barrel storage tanks, connecting pipeline system, and access and internal roads. USD will be responsible for building the loading facility, Gibson will be responsible for building the storage tanks and connecting pipeline system, and Canadian Pacific Railway will move the rail tank cars. Trains with 120 tank cars will be very long and heavy, and will travel very slowly as they enter and leave the loading facility. This will result in significant increases in noise, exposure to carcinogenic locomotive diesel fumes, and wait times at local railway crossings. 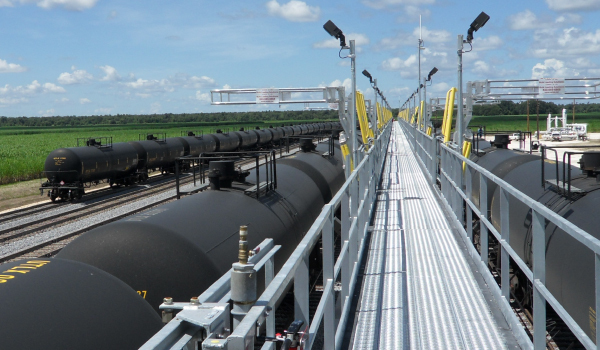 The terminal and unit trains will pose safety hazards including potential spills, leaks, fires and other accidents. This hazard is very real, particularly considering the high number of derailments and other rail accidents in Canada. Rail yards, such as this one, are particularly prone to accidents. Construction of the facility and the subsequent movement of so many locomotives and rail cars will cause a lot of noise. Toxic odours (including some H2S) will emanate from the loading operations and carcinogenic diesel exhaust will be given off by idling and slow-moving locomotives. Nearby property values will also be negatively impacted. There will be major environmental impacts of a facility as large as this one. See Railroaded Fact Sheet #3 for more information on the negative impacts of rail yards and terminals that store and move petroleum tank cars. See this link for detailed information on derailments, and this link for information on the many risks of transporting crude oil and other hazardous products by rail. ~ by railroaded on January 4, 2013.